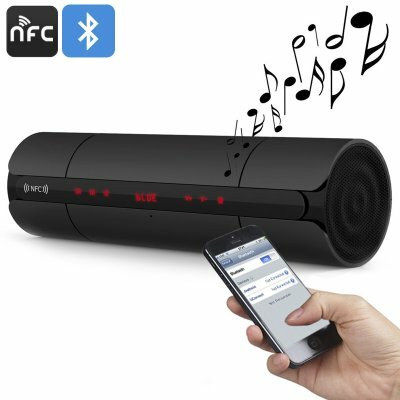 Successfully Added Wireless Bluetooth Speaker - NFC, 3D Sound Technology, Built-in Mic, 4 Hours Play Time, FM Radio Function, 32GB TF Card Slot to your Shopping Cart. Carry along your favorite music where ever you go with this magnificent Bluetooth speaker. Weighing just 0.45KG and featuring a small design this portable speaker can be easily carried along anywhere you go. Whether you go on an afternoon picnic and want to enjoy some of your favorite tracks while enjoying the sun and company of your friends outside, or if you are simply looking for a stylish accessory for in your living room – this wireless speaker has an answer to all your needs. With its modern rounded design, black body, and red backup lights this portable Bluetooth speaker features an extremely stylish design that is guaranteed to turn some heads. Equipped with a touchpad this speaker features no external buttons, giving it a smooth look. Additionally, it also holds a built-in microphone, allowing you to answer your phone and make hands-free calls without the need to get up and reach for your smartphone. Equipped with the latest 3D sound technology this speaker delivers true audiophile grade music quality that is a true feast to your ears. Impress your friends with stunning sound quality while letting them enjoy their favorite songs whenever they want – simply pair this Bluetooth speaker with your smartphone and you have unlimited access to your tracks no matter where you are. Besides Bluetooth this portable music speaker also supports NFC, allowing you to easily pair it with all smartphones that support this feature. Holding a massive battery this NFC speaker provides you with a stunning 4 hours of continuous play time on one single charge. From now on you can head out with confidence as with this portable Bluetooth NFC speaker you can be assured that you will always be able to listen and share your favorite tracks with friends and loved ones no matter where you are. Additionally, this speaker also supports FM radio frequencies allowing you to listen to the latest songs, talk shows, news, and more at any time of the day. A great item and great service as always from ChinaVasion.